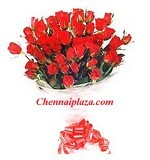 Flowers Boutique > Delightful Roses. Item Description A lovely posy of 12 fresh dutch roses, carefully hand-tied and message included to make it all the more delightful. Delivery available only at these Locations. Please order atleast 2 days in advance. Item Description A lovely posy of 24 fresh dutch roses, carefully hand-tied and message included to make it all the more delightful. Delivery available only at these Locations. Please order atleast 2 days in advance. Item Description A lovely posy of 50 fresh dutch roses, carefully hand-tied and message included to make it all the more delightful. Delivery available only at these Locations. Please order atleast 2 days in advance. Item Description A lovely posy of 100 fresh dutch roses, carefully hand-tied and message included to make it all the more delightful. Delivery available only at these Locations. Please order atleast 2 days in advance.